I loved my first job out of college at a swanky Manhattan law firm for a variety of reasons. One factor I’ve recently appreciated is these sentiments were encouraged Pavlovian style. I associated going to work with the reward of an anything one could desire, made-to-order breakfast for a few dollars at the firm’s cafeteria. So when my alarm would go off, visions of turkey bacon and cheddar cheese toasted sandwiches with a side of fresh berries and ground peanut butter danced through my head. In my third trimester I have a whole new set of associations for my current job. Today when my alarm went off, I envisioned pain and immediately slammed the snooze button. Eight hours of sitting at my desk has been pure torture on my heiny. To be fair, my employer provides me with a cushy, ergonomic chair; it’s just no match for the weight of my basketball-sized uterus on my tailbone for hours on end—the one I’d injured while playing on the monkey bars as a kid. 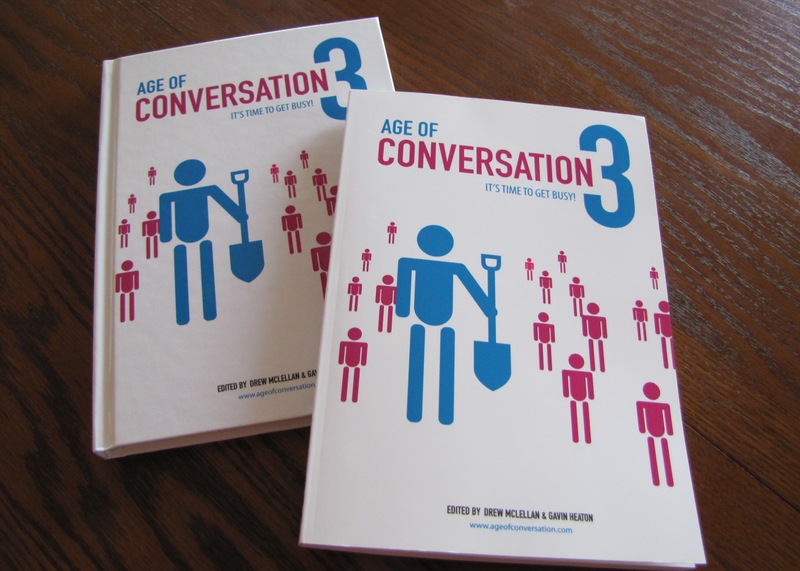 Today is the big day–the anticipated launch date of the book I co-authored with top bloggers from around the world–Age of Coversation 3! It’ll soon be available on Amazon.com, BarnesandNoble.com, kindle and the new iPad thanks to Channel V Books. Disclaimer: If you’re the type of person who squirms at the thought of buying a box of tampons or at women experiencing bodily functions, this is not the post for you. If, however, you are pregnant, have been pregnant or have/have had a pregnant partner, you’ll likely relate and chuckle. I’ve watched enough television and friends go through their pregnancies to recognize common pregnancy symptoms–nausea during the first trimester, crazy cravings, moodiness and changing physique. Yet, much like my previous understanding that wine was off limits, but cheese was okay (soft, unpasteurized cheeses are a no-no), I was in for a few surprises. Big surprise #1: My next jog would likely involve a stroller. Prior to my pregnancy, I thankfully (and to my husband’s benefit) did not suffer from severe PMS. My biggest complaint was that my road rage would get out of control for a couple of days a month–easily remedied by a refreshing jog. Therefore, I wasn’t prepared for the effects of the surge of hormones to which I was about to succumb. I had planned on running away these moodswings, as I had been accustomed, until the third trimester made me too unbalanced and uncomfortable. Everything I’d been told suggested I could continue all of my routine activities. My doctor convinced me I wasn’t going to shake out the baby (of which I was convinced before implantation) and gave me the okay to run, so long as I kept my heart rate under 140 beats per minute. I sucked up the price, purchased a heart rate monitor and started my customary four-mile jog around town. I think I made it about 30 seconds before the limit alarm started beeping. Big surprise #2: Growing baby brings issues with exits on both ends. Although I’d soon miss my escape mechanism, my body wasn’t up for running at the time anyway. My breasts ached, and since my wedding four months prior, I’d been experiencing severe stomach issues leading the GI doc to run every test under the sun to diagnose/cure them. The colonoscopy, a process that earned me the right to feel completely comfortable talking about my poop, ruled I had a bad case of IBS. This worsened exponentially during my first month of pregnancy. To top it off, I was suffering from such uncomfortable gas pressure that I didn’t care if I was with the CEO of my company; should the rare opportunity arise, I was letting it rip or risk floating to the ceiling like a helium balloon. The baby docs (plural because I see a partnership) say most pregnant women would be elated to experience my symptoms–the reverse of the norm. Thankfully, they’re manageable now. Big surprise #3: Hello, bathroom. Due to my aforementioned GI issues, I was becoming quite accustomed to the bathroom–all bathrooms, without the luxury of preference. I knew this would be good experience for when the baby crowded my bladder, again in the third trimester. I had no idea frequent urination was an early pregnancy symptom. And just when the books (remember, six of them) had indicated a respite from the frequent trips, the UTI infection kicked in. Merry Christmas to me, the antibiotics worsened both my GI issues and turned the nausea to straight up vomiting. My kind new in-laws gracefully accepted my absence from holiday activities. I sucked down every last evil pill to avoid a recurrence. However, the symptoms returned, requiring me to drink 11 glasses of water before 6 p.m., or face the consequences. Thus, I can easily walk from one bathroom to the next and have to go again. On the positive side of things, I’m used to getting up all night and thus, ready for nighttime feedings. Big surprise #4: Labor ain’t the only pain. Before discovering I was pregnant at four weeks, I was experiencing difficulty sleeping on my customary left side. I attributed this to what I’d termed my “maybe baby”. As she grew, so did the cramps and the discomfort being seated with a squished abdomen. Then from about weeks 12-18, sciatic nerve pain shot down my left buttock, generally in the evenings. Thus far, the occurrence of round ligament pain has been minimal, yet just like the lady at the hospital’s Great Expectations seminar had described– “not fun”. At 20 weeks, the acid reflux has started, burning my throat. Thankfully, I’ve already given up fried and spicy foods, caffeine, and chocolate. Goodbye, citrus and tomatoes. Needless to say, my experience makes it difficult for me to believe the women who claim they had no idea they were pregnant. It’s been an alien invasion, and there’s no denying it. I keep saying she’d better be nicer to me after she’s born! Although I write for a living, I’ve just begun my journey as blogger. Admittedly, I have much to learn yet lots to share. As one Irishman once told me, I didn’t need to kiss the Blarney stone for the gift of gab!